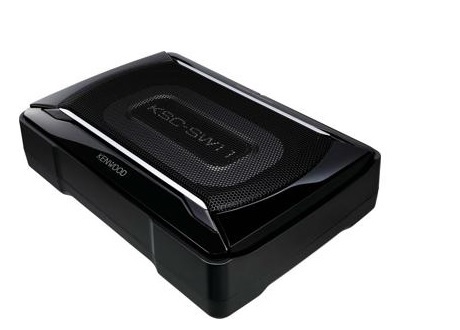 View cart “Kenwood KSC-SW11 – 150W Peak Powered Subwoofer Enclosure with Bass Remote” has been added to your cart. The Kenwood KSC-SW11 powered subwoofer is considered as one of the best value compact subwoofers in its price range for good reasons. Its compact dimensions belie the impressive bass sound that it can produce with its low-frequency response – truly, a little powerhouse on its own. While the bass sound will not rattle the windows of cars in the vicinity even when it is at its fullest power, you should feel a satisfying thump that adds a deeper layer to your music experience. If you have small speakers, you can invest in the Kenwood KSC-SW11 and add the missing piece to your in-car stereo system. The bass sound is clear, clean and tight, which blends in so well with existing speakers. Just take note that the subwoofer has mid-range capacity and set it there to avoid getting a muddy, even muffled, sound. The bottom line: With its active subwoofer design, 150 watts input power, and built-in amplifier, you will have a relatively affordable yet good quality subwoofer that can compliment your existing car stereo system. Even the amplifier packs a punch with its low-pass filter and phase inverter. Don’t dismiss the tiny powered subwoofer’s durability either. The unit has a rigid aluminium enclosure to eliminate rattles as well as a durable wiring harness and mounting brackets, thus, making it so easy to install in many tight spaces. Even its installation is easy. Check that the head unit comes equipped with set of RCA outputs but the Kenwood KSC-SW11 already comes with a wiring harness for easy installation. Hook up the wires, plug the wire harness, and attach the remote plug and you are ready to go. You can control the subwoofer with the wired remote, which can be set at zero degree for the phase setting. You will find that the best sound comes from 90 percent of the maximum volume and the crossover set at near-maximum, too.